Later this summer, EPA will publish its final Clean Power Plan rule, regulating greenhouse gas emissions from existing power plants. Though the final rule has not yet been released, policymakers, state governments, utility operators, and other stakeholders are weighing their options to reduce carbon dioxide (CO2) from the power sector in compliance with the rule. As states consider plans to submit to EPA, they will want to evaluate the costs of their compliance options, but comparing different strategies can be complex. 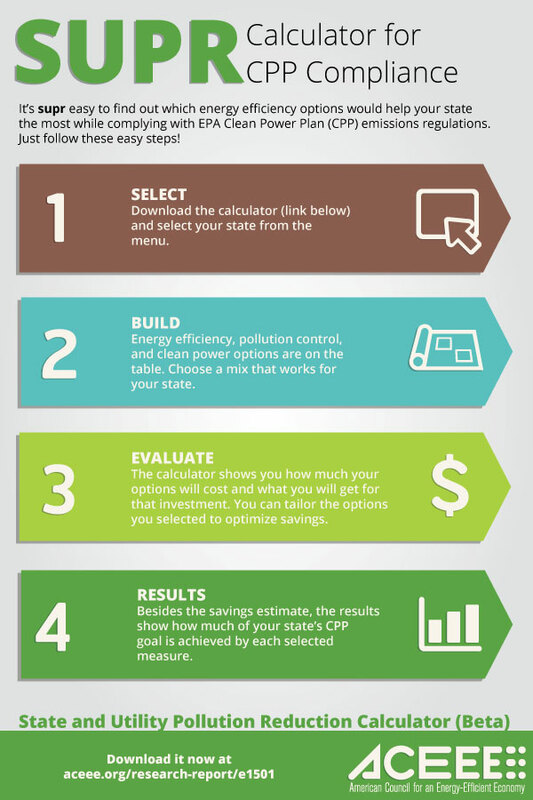 To assist states in exploring the cost and pollution reduction potential of different options, ACEEE has created the State and Utility Pollution Reduction (SUPR) Calculator (Beta). The proposed Clean Power Plan rule that came out last year allows states flexibility to pick from a host of pollution-reducing technologies and policies when designing their compliance plans. Energy efficiency is included in those options, along with renewable energy, nuclear power, natural gas generation, improvements to power plants, and many more. For example, under the proposed rule, South Carolina is required to reduce its emission rate by 57%, to 772 pounds per megawatt-hour (MWh). In SUPR, you can pick from our options to see what you would need to do to comply with the rule. 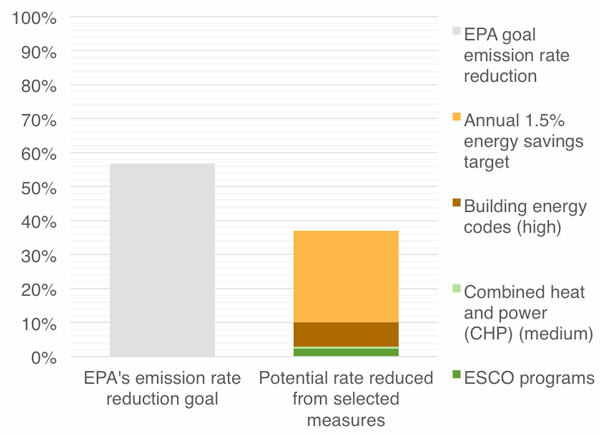 If you select an annual 1.5% energy savings target, building codes (high), combined heat and power (medium) twice, and ESCO programs, the results show that those policies together achieve 65% of the state’s compliance target, at a lower cost than many other compliance options. In addition, you can see in the figure—one of many in the calculator—how close the selected policies get the state to its goal. We will continue to refine the SUPR calculator to make it more useful. Please reach out to Sara Hayes (shayes@aceee.org) or Rachel Young (ryoung@aceee.org) with questions or suggestions. For more information regarding the SUPR calculator or other information on the Clean Power Plan, see our dedicated web page on the topic.